Thu., Oct. 6, 2016, 5 a.m. The Friends of the John Wayne Pioneer Trail was organized in 2016 shortly after the 2015 Washington Legislature nearly gave the rail trail away to adjacent East Side landowners. “There’s nothing quite like this trail across most of Washington, and that obscure legislative move woke us up: we need to support it,” said board member Garry Kehr of Spokane. Overall, the route is the longest rail-trail conversion in the United States, following the former Milwaukee Road railway right of way for about 285 miles across the state of Washington, from the western slopes of the Cascade Mountains to the Idaho border. The trail is part of Iron Horse State Park, which also specifically refers to the developed portion of the route over the Cascades west of Ellensburg. East of Ellensburg the trail is mostly undeveloped. The trail from the Columbia River east to the Idaho border is called the John Wayne Pioneer Trail, a name adopted for unclear reasons when the Legislature approved the purchase of the abandoned railway corridor in the 1980s. “One of our short-term priorities is helping Washington State Parks change the name to something more appropriate,” Kehr said. A John Wayne Iron Horse State Park Trail Plan has been adopted by state parks officials to address issues such as noxious weeds, vegetation management and trespass and fencing concerns expressed by property owners who live and work adjacent to the trail. 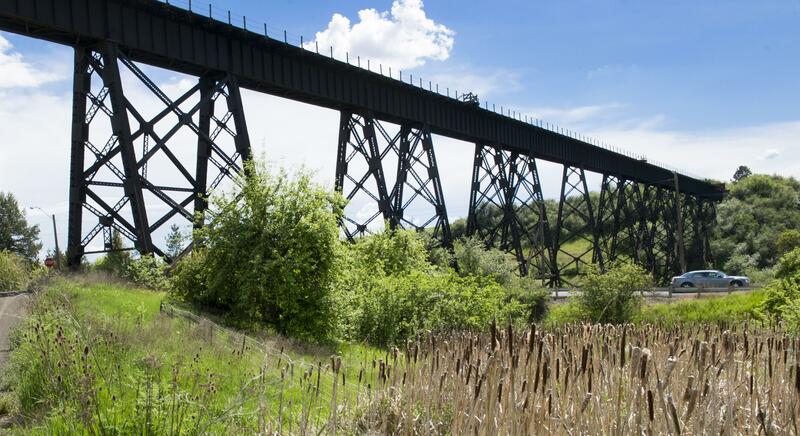 The plan identifies needed support facilities, including trailheads, bridge and trestle repairs and future camping opportunities. A 12-member advisory committee was appointed to advise park staff in the planning. The committee includes adjacent landowners, hikers and equestrians, as well as representatives of tourism bureaus and heritage organizations. The advisory committee met five times in Moses Lake between December 2015 and late June 2016, and State Parks additionally held four public meetings in Cheney, Ellensburg, Preston and Ritzville to gather public feedback for the plan. The plan considers acquiring or developing agreements to manage existing gaps in land ownership, including about 4 miles of private property and 40 miles managed by the state Department of Natural Resources. Although the trail is in Eastern Washington, the friends group has members from all over the state, Kehr said. Ted Blaszak, a trail advocate and Tekoa Trail and Trestle group organizer from Tekoa, said 35 towns and city councils across the state have passed resolutions endorsing development of the trail. Among those supporting towns are Cle Elum, Cheney, Colfax, Ellensburg, Garfield, Moses Lake, Oakesdale, Palouse, Pullman, Ritzville, Rosalia, Rockford, Spokane,Tekoa, Walla Walla and Wilson Creek. Other short-term priorities for the Friends group include restoration of the Tekoa Trestle and the Renslow Trestle, which crosses Interstate 90 east of Ellensburg. “We’re enthused that the State Parks and Recreation Commission has given high priority to improvements for this trail, which gives it higher ranking for funding and grants,” Kehr said. Published: Oct. 6, 2016, 5 a.m.